This unusual name is Scottish in origin, and is a shortened form of the name 'Mackeggie' or 'Mackaggie'. The name derives from the Gaelic M' Adhamh or M' Edhamh, meaning 'son of Adam'. The first recording of this name in Scotland is during the reign of Alexander II, (1214 - 1249), when one Gillemur Mac Egn was witness to a convention between the Abbey of Scone and Adam, son of Odo. 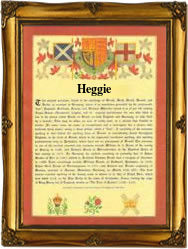 The history of the shortened form 'Heggie' in Scotland includes the names of Patrick Hegy, who held lands in Perthshire in 1567, James Heagie, who was a merchant burgess of Stirling in 1617, Janet Heggie, witness in Burntisland, 1640, and John Heggie, recorded as school master at Forfar in 1670. The first recorded spelling of the family name is shown to be that of Donald Hegy, which was dated 1546, Register of the Privy Seal of Scotland, during the reign of Queen Mary, Mary Queen of Scots, 1542 - 1567. Surnames became necessary when governments introduced personal taxation. In England this was known as Poll Tax. Throughout the centuries, surnames in every country have continued to "develop" often leading to astonishing variants of the original spelling.